I recently had a good laugh reading Elvis Costello’s remarks after an interviewer followed a line of questioning that Costello deduced must have been derived from his Wikipedia entry. It is a fact that most muses about Costello simply regurgitate the same worn-out list of notable artists that he has worked with. How could anyone have overlooked Costello’s remarkable 37-year recording history? For starts– from 1977-79, the man born as Declan Patrick McManus recorded and released three of the greatest albums in rock history. 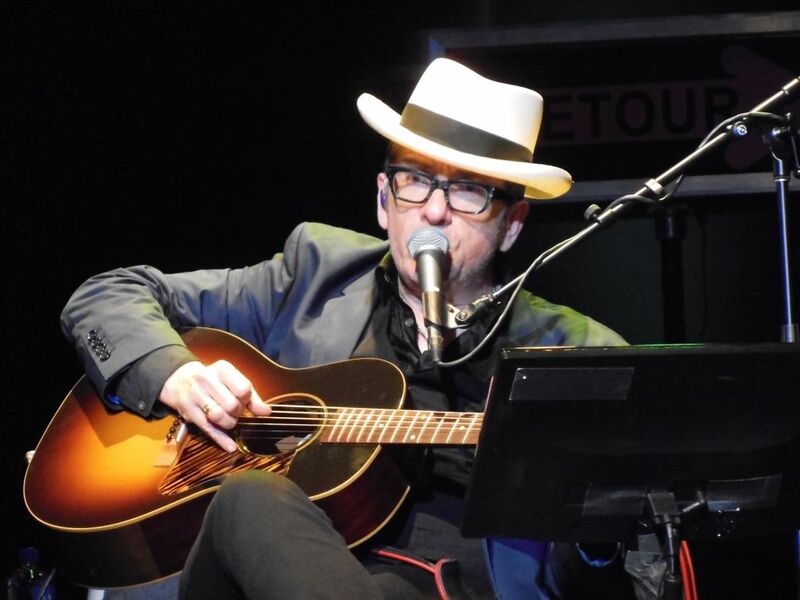 Costello may not be as creatively prolific as he once was—records coming out farther apart–but he still remains quite faithful to the road. These days find him touring one of three ways: solo; fronting his rock band, The Imposters; or backed by a local symphony. 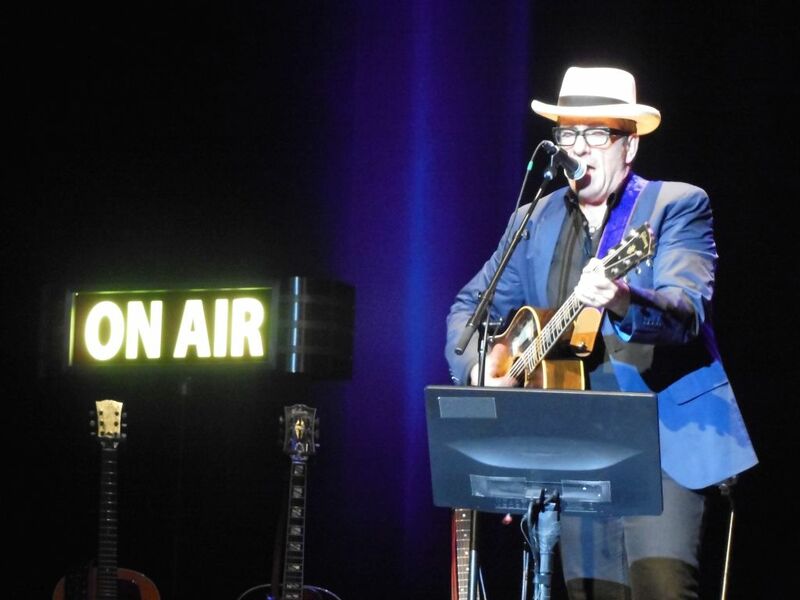 Thirty years ago, Costello embarked on his first ever solo tour, and I was fortunate to see two shows at the Warfield Theater in San Francisco. Costello had me completely spellbound: When he finished his main set, I could not believe how quickly the time had passed. This was one of the first times I saw an artist strip down his “band” songs and play solo—a format for which Costello deserves more credit for proliferating. In fact, one person in the audience that night impacted was Bruce Springsteen who later became inspired to do the same thing. I often find myself pointing out parallels in the careers of Elvis and Bruce who now share the tour practice of playing an ever-changing set list. Each includes crusty old songs that you never thought you’d ever hear live plus a challenging selection of cover songs. 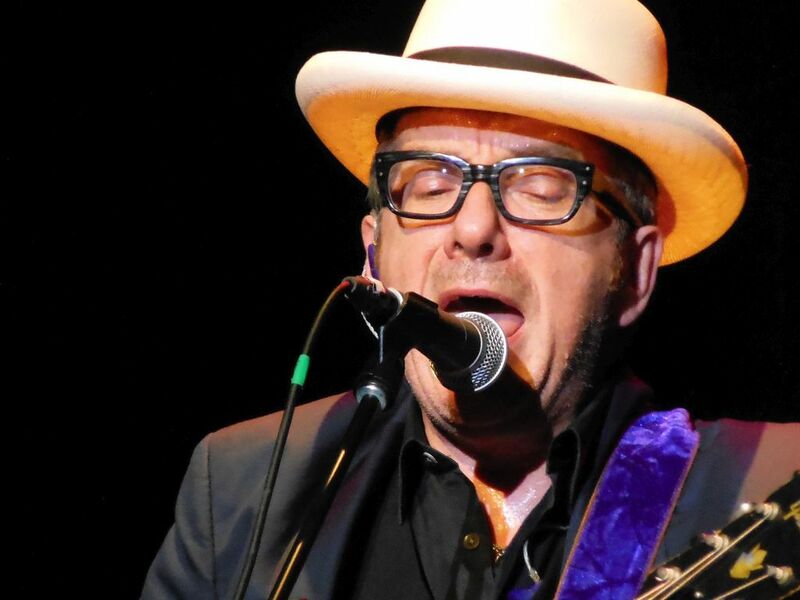 For Costello, Knoxville was no exception throwing in ancient B-sides like “Ghost Train” and “Hoover Factory” and covers that paid respects to recently departed songwriters Gerry Goffin (“Goin’ Back” and “Will You Love Me Tomorrow” with Larkin Poe) and Jesse Winchester (“Quiet About It”). He also pulled out more surprises with “Long Distance Love,” an old Little Feat relic, and Richard Thompson’s “Withered and Died.” This night the latter, he once recorded as a B-side, was a dark but tender duet with Larkin Poe’s Rebecca Lovell. Tonight at the gorgeous, historic Tennessee Theatre, he performed mostly solo. 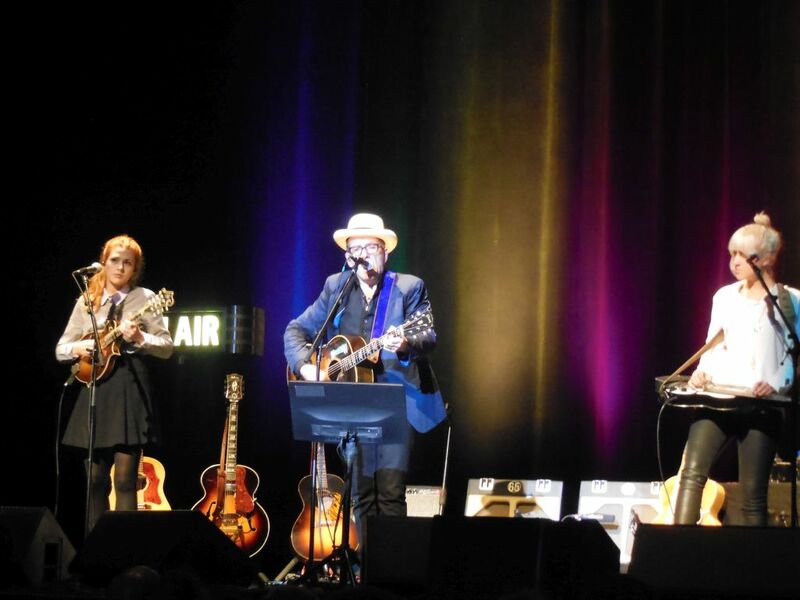 Starting this tour a few weeks ago without an opening act, Costello picked up the familiar sister duo Larkin Poe the night before in Atlanta to open a three-show stint. The sisters, who have history playing with Elvis, joined him mid-way through his set on backing vocals and guitars. 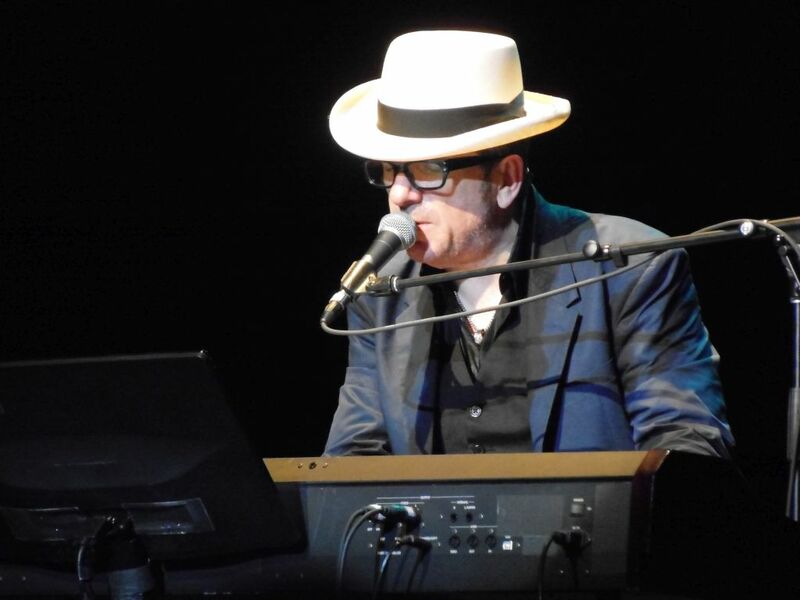 The stage setting for his tour has three stations at which Costello performs: a mike at center stage where he stood most of the evening, a chair at stage left where he sat for a few numbers mid-set, and a keyboard at stage right on which he only played “Shipbuilding.” Each position was equipped with an electronic music stand to aid him—a reasonable prop given the vast body of songs from which he has been playing. Costello experienced some minor vocal issues. There were a few dropped notes and crackles in his voice, but he did his best to work around whatever was ailing him. It was an evening not only graced with Costello’s musical talent, but with his charm and wit as well. Although his stories are somewhat scripted, they are nonetheless quite engaging. Again–as in 1984–I was truly mesmerized by one of the best solo performers in the business. Here’s hoping that he keeps it up for another 30 years.